Le Club AccorHotels has now launched new bonus miles offer for Air Canada Aeroplan member stays between May 9 – June 30, 2017. Aeroplan members can earn triple miles for stays if they are booked May 9 – June 30, 2017. There is a prize draw for 50,000 Aeroplan miles as well. Note that you must have your Le Club AccorHotels earning preference set to partner miles/points and have Air Canada/Aeroplan set as the preferred partner. 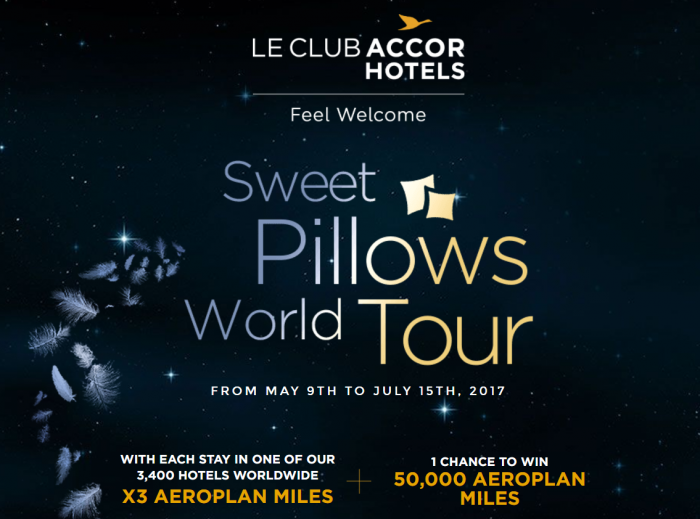 Interesting that Le Club AccorHotels still has this “Sweet Pillow Tour” going on. The first airline offers under this promotion appeared back in February and have already ended. 2. This offer entitles Le Club AccorHotels members, regardless of their status, to triple their Rewards points for their stays in a Le Club AccorHotels loyalty programme participating hotel, and the ability to participate to a lucky draw to win 50,000 Aeroplan Miles, equivalent to 100,000 Le Club AccorHotels Rewards points. The lucky draw terms and conditions are available here. This Rewards points bonus is offered in addition to the Rewards points and Status points that are usually earned by the Le Club AccorHotels member on completing an eligible stay in accordance with the Le Club Accorhotels General Conditions of Use. This promotion does not apply to stays in Le Club AccorHotels partner hotels. The number of Rewards points earned via this offer are calculated based on the number of points earned by a member with Classic status. In order to benefit from this offer, the member must have activated Aeroplan as their preferred automatic conversion option ahead of the stay. This option must remain activated until the Rewards points related to the stay have been credited to the member’s Le Club AccorHotels account. 3. This offer is valid for all stays in a participating hotel completed by a member from May 9th to July 15th 2017, and booked between May 9th and June 30th 2017. 9. The Le Club AccorHotels Rewards points bonus will be credited to your account within 10 days of checking-out and then converted to Aeroplan Miles within 6 weeks in accordance with the current conversion terms. Next articleReader Question: Bought SPG Gold (Maps To Marriott Gold) Off Of Ebay – Someone At SPG Corporate Selling These?